As we’ve stated a few times before, while there are only two bipeds in our household, it is still quite a populous one. We have three dogs, three cats, all well loved. We also have four chickens, and a fish tank we do not pay as much attention to as we should. We also have a lot of past companions that we miss. Some shared our lives after we had become partners, some are memories just to me, or just to Mister Tea. I spent a lonely time for a year or so after my marriage disintegrated with no furry friends. 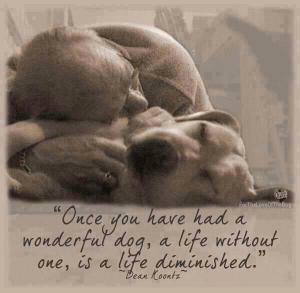 It had been almost unimaginable prior, as there had always been a dog or a cat or both, in my life. There is an amazing element that they add to reality. Unless we absolutely have to, I doubt that Mister Tea or I will ever want to experience that gap again. We may post about the friends lost when we were younger another time. If nothing else the Ms. Kitty and Brig anecdotes are fairly spiffy. As far as it applies to the two of us as Desert Sage Natural, however, there are some very important friends to introduce. As you know, if you follow us, we make herbal teas for cats and dogs as well as for humans. There have been a number of very important willing test subjects who have vetted our teas for us. We thought you might like to know who they are. I will start with the puppy-mutt who started it all. Her name is Domino. Early in our relationship Mister Tea and I had a series of conversations about dogs and how much we wanted to be sure we were not lacking in dog as we moved forward. 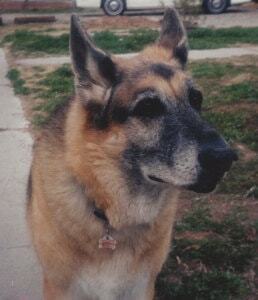 At the time we were living with Jackson, an elder statesman of a German Shepherd who was ridiculously old, for the breed. He’d been a Dade County drug dog, had been retired due to arthritis at 5, was adopted by a bloke who’d ended up in New Mexico, as our roommate. We’d fallen in love with Jackson, and when the roommate decided to find greener pastures that did not involve Jack, we were more than willing to keep him with us. Honestly, I am not sure if we could have done anything else. However, he was seventeen at the time. He was such an amazing dog, we wanted to add a puppy into our household mix for two reasons. We wanted him to have a hand in her training, and we were hoping a puppy would give him a renewed energy in life. We didn’t think we were at a place where we could have a puppy yet, so we held off acting on the decision. We wanted to be sure we were stable enough to manage the basic initial needs, and proper integration of a new pup. However, Mister Tea’s parents offered to take us to the fairgrounds to look for things we needed. This was before we had a vehicle, and there were certain necessities that we knew would potentially be more affordable from the vendors there. We accepted the offer. We found a much-needed double boiler (essential to the making of Welsh Rarebit), some raw local honey (brilliant for so many things), and had a generally grand time. What we had not known prior was that there was also a pet-adoptathon going on. So we went to have a look. What’s the harm, right? If you are a dog or cat person, you know that we were incredibly wrong in this assessment. We noted her, and thought she was pretty awesome, and after we’d gone inside, found out a little more about her. But it was an adoptathon, and we both love dogs, and we’d had an idea of the sort of dog we’d be looking for, and wanted to look around. We found out that she was ostensibly a heeler cross, although a tank of a heeler cross. We hadn’t expected to, but we seemed to have a thing for heeler crosses that particular day. There was a red that was quite neat, another red who was also pretty cool, and then there was a trio of chocolate dobies that caught our eye, and a few others who were just neat to interact with, but that we didn’t really connect to on the same level. I took copious notes on the various dogs, and finally, as the adoptathon was coming to a close, we realized we were taking a dog home. There wasn’t really a way around it. We’d made the decision before ever coming in, we just hadn’t planned on actually doing so yet. But if you’ve ever been to an adoptathon, it is really hard to resist all the amazing puppies who need homes. We hemmed and hawed and finally looked into where the various dogs we had been interested in were staying. 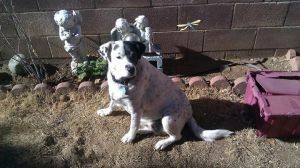 All of them, except that black and white heeler cross, were at no-kill shelters. She was at the city shelter. She was also on her last day. So the decision was made. She was an awesome dog, we’d already figured that part out – but if we didn’t bring her home with us, she’d be gone by the next morning. We prepared to bring her home. We made the final introductions to make sure we were okay with her and she was okay with us… and this was before we had to make sure dog + wheelchair was functional, so it went well. We signed the initial paperwork, and headed to the last stage. Which turned us to the exit. Which had a huge sign over it (the only place in the building to have it) stating the fees for taking a dog home. They were sizable enough that I had to stop and do math. Lots of math. Lots of semi-painful math. In the end, we had a bulk bag on chicken of hand, we’d just refreshed our cheese supply, had some miscellaneous fruit, and I always keep a big bag of rice in the kitchen, for various purposes. I figured that we could take the hit, if we were willing to eat lots of the same thing over and over for a bit. 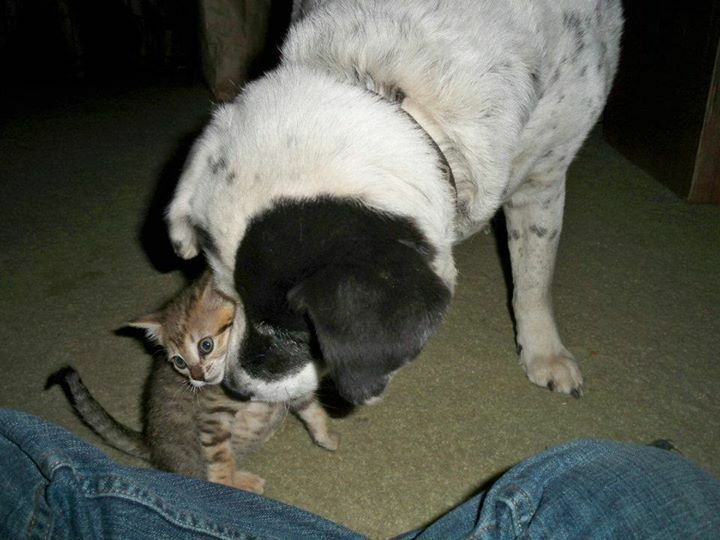 Domino and Jack got along famously. He did get the revitalization we’d been hoping for, for a time. I think, in the end, his life was probably extended, and the end of it happier, than it would have been if he had not met her. And we loved her. And still do. There are so many stories about this wonderful black and white tank-dog who came into our lives so randomly. Many many years after she came into our lives, I was working with herbs, and had been for some time. She started acting really tired. Almost all the time. At first we explained it as age. Even not having a decent guess as to the other breed (or breeds) in her makeup at the time, we’d always kind of known that a larger breed dog was involved. As much as I hated to think about it, I’d always assumed we’d have less time with her than we would have wanted. Through an intensely painful randomness we ended up with the wherewithal to take her to the vet. We’d discovered and tracked a lump on her side. It changed shape and size and was a weird texture. We were pretty sure our pup had cancer. The influx came because Mister Tea’s beloved grandmother had died, and she left us some money. She loved Domino, and she had told me many many times that she would want us to take care of Domino properly if ever there were the funds. So, we took Domino to the vet. There were scans, that were horrifying, initially. There was the assumption that the cancer had spread. As it turned out, Domino’s internal organs were just huge. Talking to the vet and looking through the breed books while waiting, we finally figured out what her cross was. I’m not entirely sure why anyone would let a Heeler and a Great Pyrenees breed, but it did explain a lot. However, even without spread to organs, the tumor was still huge. It needed to be removed. After they’d done so, we found out the thing had been the size of a medium watermelon. The doctors were shocked. Skipping over some of the drama that happened in the aftermath, the cancer recurred twice. Domino made it clear after the third surgery that she didn’t want any of this ever again. So, desperation made me me suddenly realize that I had source for herbs and pets. I spent the next week or so gathering more and researching dogs and cancer. I came up with a blend for her. She’s still with us, two years later, having given more time to us than we had any right to expect. Her breed combination is not a great one, and the predisposition to cancer adds a whole ‘nother wrinkle. But she is still here. Still loving. Still loved. We manage her arthritis with herbs, as well. She has trained two puppies for us, and I do not think that either of us can imagine the last 11 and change years without her. 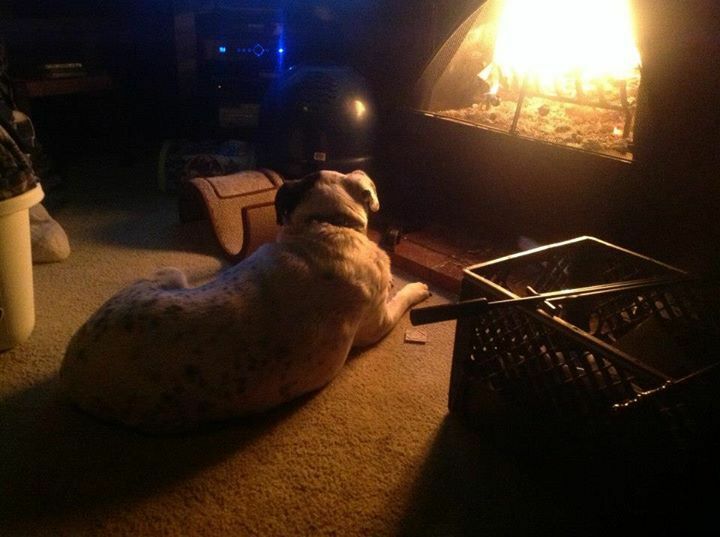 She is our Domino, our eldest pound puppy, and she is amazing. This entry was posted in Ramblings and tagged Desert Sage, Dogs, Herbal Medicine for Dogs, Herbs for Dogs, Our Household, Tea Testing by DesertSage. Bookmark the permalink.